Lewis Claybon has been standing on a corner along Tower Grove Avenue in St. Louis for "a long, long time. About 14, 15 years," he said, waving to passers-by. 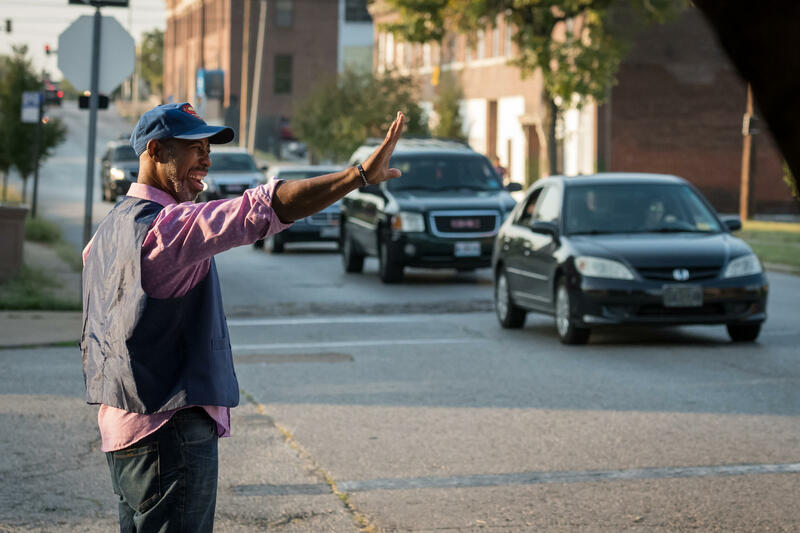 It would be just another stop sign in St. Louis if there wasn’t this man on the corner of Tower Grove and Vista avenues, his hands in the air, waving and hollering greetings at every passing car, cyclist and pedestrian. For brief moments, commuters slow down and the daily grind eases. Everyone waves back. 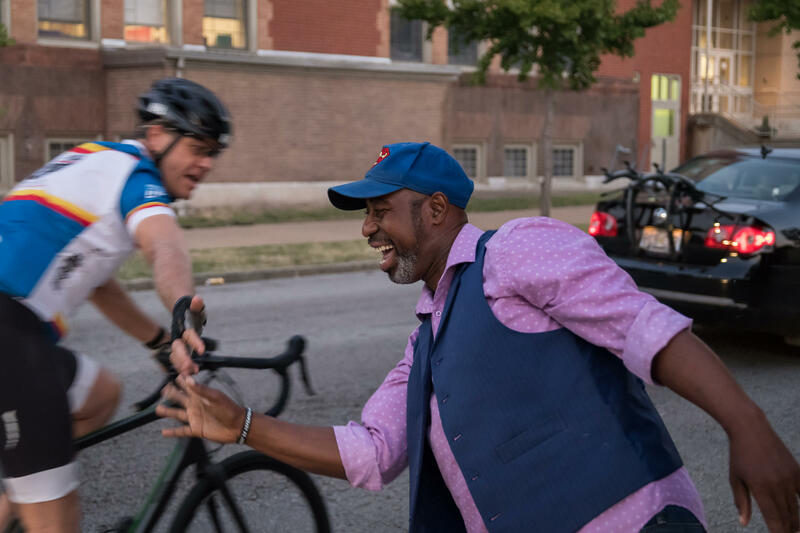 St. Louis Public Radio's Ryan Delaney introduces us to Lewis Claybon, the bringer of joy to the Grove neighborhood in St. Louis. Lewis Claybon, 52, is out there before the sun comes up every weekday, dispensing his smile and wave and marshaling children off to school. Cars honk hello. Cyclists swerve to land a high-five. Trucks slow so grown men can lean out the window and dance with him. "I watch people light up," Lewis Claybon said. "They do my dance." 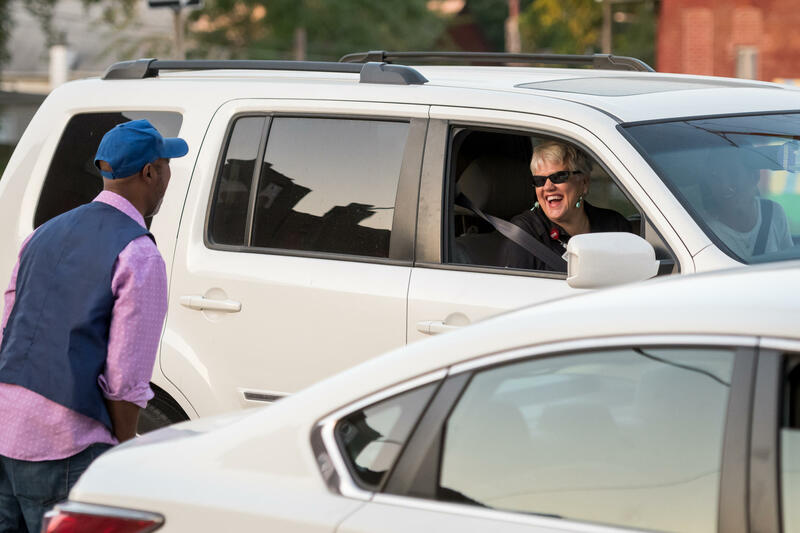 Claybon begins waving from the corner of Tower Grove and Vista avenues in St. Louis' Grove neighborhood before dawn every weekday. 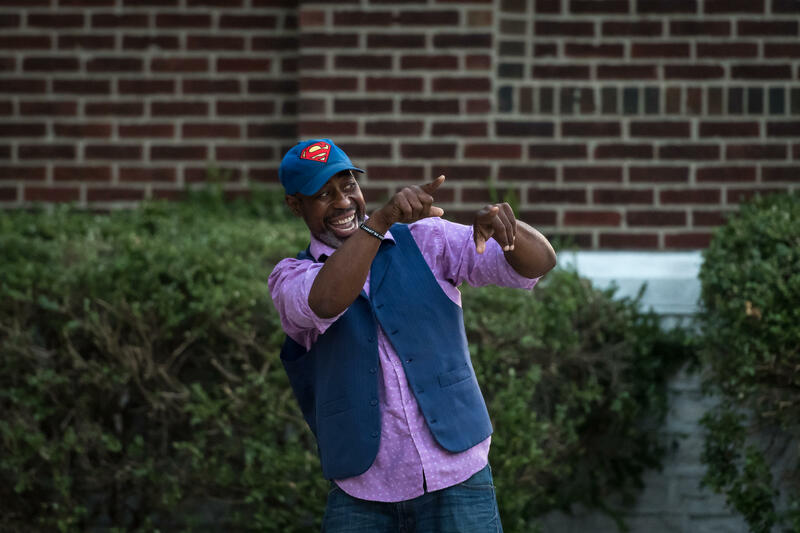 Claybon is known to most as “Brother Lewis.” He cooks at Lamb’s Bride Child Care Center and ministers at its church. For more than 15 years, he’s also been a greeter, crossing guard and volunteer at Adams Elementary School across the street. "They like the smile and wave," Claybon said about the people passing by. "They like it, they enjoy it. They just let me know that people need it, they need some encouragement. Sometimes the coffee ain’t gonna do it." Claybon is a constant presence. The only thing that changes is the hat he wears — from a cowboy hat to a baseball cap with a Superman logo. Those put him in character, he said, setting the tone for his day. 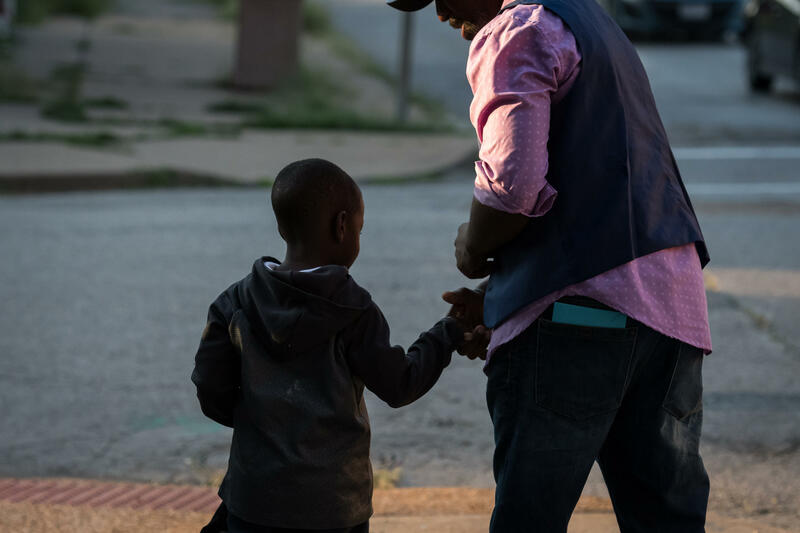 Claybon was born in East St. Louis, where he said growing up was tough and school was hard, but he would do anything to make someone laugh. He moved to St. Louis in the mid 1980s. 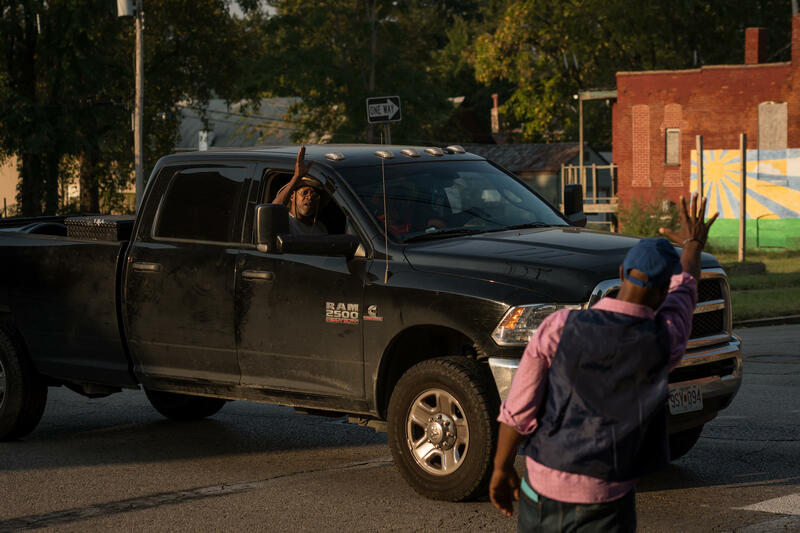 One day, maybe 15 years ago, he estimated, Claybon woke and glanced out his window to see a girl waiting for the school bus by herself in the dark. He’s been watching over this block ever since. "We’re family. He’s family. That’s what we got to understand, that we all family," Claybon said. "And the more I put that in their ear, the more they receive it." He’s not married, has no children of his own. But he has a family, he said: every passer-by. “No matter where we from, we still all family. And the more I put that in their ear, the more they receive it,” he said. Paula Phillips, a former Adams employees, sends her kids to the day care center where Claybon makes lunch. Claybon often greets small children with a playful 'rawr' before helping them cross the street or board a school bus. Phillips was starting a new job that morning. “Don’t be late,” Claybon called out. Linda Menard’s career — and 10 years of driving past Claybon — came to an end last week. But she couldn’t go without giving him a thank-you card. And that’s the whole point for Claybon, who said he’ll be on this corner until he can’t wave his arms anymore.